The BEST Chocolate Chip Cookies EVER!! 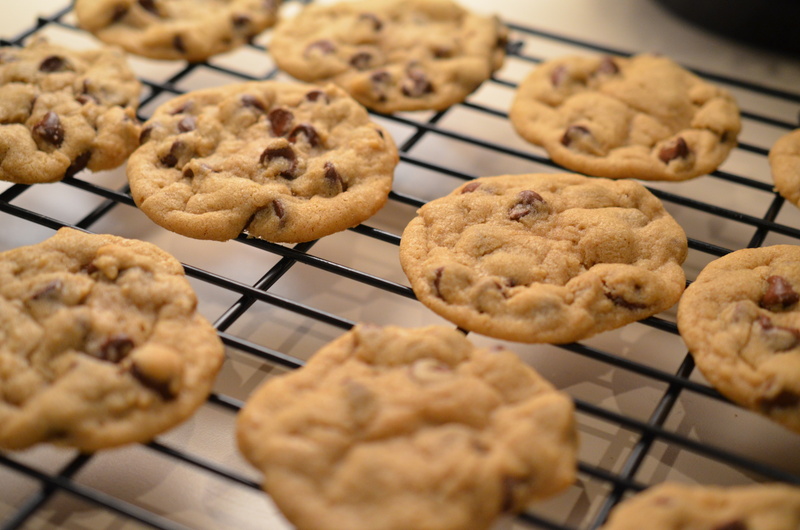 I love this chocolate chip cookie recipe! LOVE IT! I love making them for me! I love making them for family! I just love eating them fresh out of the oven with an ice cold glass of milk!!! Add the melted butter to the sugars and whisk well, set aside to cool. When cool, add the eggs and vanilla. Transfer butter and sugar mixture to the flour bolw and mix by hand until ust combined. Don’t over mix! Fold in the chocolate chips and nuts if using to the cookie batter. Cover and refrigerate for and hour or two, or overnight which is what I typically do. Preheat oven to 325. Drop balls, a little smaller than a golf ball onto your cookie sheet. Bake for about 12-14 minutes. 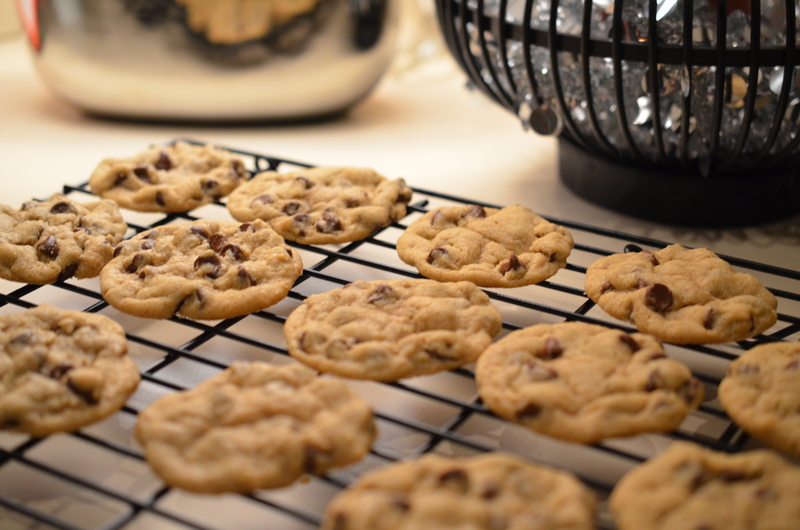 Allow to cool on your cookie sheet for about 5 minutes or so, then transfer to a wire rack to finish cooling. I bake mine on a baking stone and they bake up perfectly every time! Store in an airtight container….if they last that long! I prefer to take my own homemade meals to work for my lunch. Cafeteria food just doesn’t cut it for me in sooo many ways! And many nights I’m kinda busy with trying to get some exercise in, errands, Domestic Goddess duties or spend time with family and friends. So I need something that whips up fast and is delish, this couscous recipe pretty much takes care of it! I like to alter this recipe too, I have thrown in shrimp, changed the veggies, its awesome with aspargus tips or grilled red peppers and zucchini or squash. I’ve also thrown in some frozen corn that I wanted to use up. Go ahead and try different herbs and spices too, you really can’t mess this up…..unless you burn it! Use a large sauce pan for this. Add the oil to a pan that is over a medium to a medium-high heat, add the couscous and stir almost continuously to toast.. You may have to turn your heat back so as not to burn the couscous, this should only take about 3 minutes. Add 1-1/4 cup of chicken broth and reduce the heat to a low simmer. Add the green beans and the chopped sundried tomatoes. Salt and pepper to taste. Add the turmeric and cayenne if you are using. Stir occasionally. When the broth is just about absorbed, taste the couscous. If you would like it just a little more tender, as I do, add another ¼ cup of the broth. This makes two large servings. I like to sometimes top with a grated parmesan cheese but it is just as delicious without the cheese. You could also serve this as a side alongside fish or chicken but I prefer to make it my main dish. Grande Couscous is also called Israeli Couscous, or at least that’s what I’ve found. Hope you enjoy this recipe as much as I do, its so versatile. I love to make my veggie lentil soup! But…. There have been times where the lentils weren’t all that good. They were sort of hard. Do I soak them? Cook them longer? Hmmm… Crockpot soup!! I have this small crockpot that is great for dips at parties, a half of a chicken breast, and now for soup! I love throwing all the ingredients in before I leave for work in the morning, and when I get home I have delicious soup waiting for me!! The first time I made this soup in the crockpot, I didn’t put any meat in the soup as I don’t usually eat that much meat. But if you want meat, I suggest using cooked meat. I’ve used sausage (my fav) or shredded chicken (from leftovers). I’m also not a huge fan of beans so if you want to add a little more lentils, go ahead! Dash of cayenne pepper or any other spice/herb that you typically like to cook with. Toss all the ingredients in the crockpot, season to your taste. Turn on the lowest heat selection. I wouldn’t do this on a day that you wouldn’t get home longer than 6-8 hours. Depending on the size of your little crockpot, you may have to adjust the amounts so it doesn’t cook over while you are away. I always sit my crockpot on a plate before I add anything to it. This recipe made 2 big bowls of soup for me. And, I really love a good slice of crusty bread along with this soup. Or any soup for that matter. The Crafty Side of Me! I was so busy over the holidays with a new job, physical therapy and making a few crafts. I had intended to post them as I made them but it just didn’t happen. So I guess I’ll just have to post it all now!! Christmas a year ago, my daughter and I made those Christmas balls with the glitter, yanno which one I mean right? They are now all over Pinterest! But this year I wanted to use paint, not glitter. So I checked out TONS of You Tube tutorials and they were pretty much all the same technique. I may have used too much paint because I had some gorgeous color combinations but by the time all the excess paint drained out it had altered my designs. What I did was gathered and arranged my acrylic paint into the color combos that I wanted. I would strategically squirt in the paint, cover the opening with a piece of paper towel and shake it until I got the design and mixture I wanted. Then I set the balls upside down, turning them occasionally to get the paint to run out. Unfortunately, I did these in the evening and by the time I got up in the morning some paint had settled in one spot and ruined my design. Oh well, lessons learned. They still look pretty good and next year I’ll put them in a jar or basket for display. Next Christmas I hope to do a better job so I can hang them on my tree. I made 2 shadow boxes and I love them so much that I may do them as gifts next year. So that means I will need to start collecting coupons from craft stores and buy them months before Christmas so I can get them at a discount. I took the back off of the frame and cut a piece of scrapbook paper to fit and attached it to the back of the frame. My girlfriend has some sort of machine that prints the vinyl letters so she did that part for me. Then, while the back of the frame was off, I added different sized bells. You can add as many or as little as you want. I put the back on the frame and put the letters on top of the glass. I basically did the same thing but added some “snow”. I bought the bagged snow at the craft store, I really loved using that because some of it stuck to the inside of the glass and it looks like it is snowing!!! With the snow that was leftover, I dumped in an apothecary jar and set 2 silver glitter ornaments that I had from last year. I saw this in a magazine somewhere but they had something different setting in with the snow. The jar is pictured to the right of the glitter votive cup below. I made 2 glitter candle votive cups. I bought the glass cups at the dollar store. I quickly slathered on the Mod Podge to the outside of the glass containers and then dunked each side in a plate full of glitter. A girl can’t have too many sparkly and glittery things!! I loved the look of them in the evening when the only light I had going on was candle light! However the glitter does drop off when touched so I think I might look into some sort of a sealer to spray over it. I’ll be setting up an Etsy shop and selling them there. And finally, my gorgeous peacock feather Christmas wreath! LOVE!! I bought an peacock feather wreath at an import store and simply added the blue balls and hydrangea flowers. I was however, stuck on which color to go with. I also had some green balls and flowers that matched the inside of the feather but decided to stick with the blue. Stay tuned though, there are some additional types of ornaments that I will be making yet! I’m saving those for some cold wintery weekend when it’s just too bitter outside and I want to hibernate for a few days. It doesn’t have to be Christmas to make ornaments!!! This is a recipe that my Mom used to make for us kids, it’s a recipe that she learned to make from her childhood as a poor farm girl in the 40’s and 50’s. I remember her telling me that as a teenager, she was so embarrassed by the condition of the house, that she never invited friends over. I even remember her telling me that she stayed at the local YWCA for a little. I guess growing up that poor, made her ashamed of the way she lived, sad for the things she didn’t have and eventually she became, and Mom I don’t mean this to sound as ugly as I think it will but, Mom got a little materialistic. If you think about it, aren’t we all? We like new things, pretty things, shiny things…I do and I’m not ashamed to admit it. I even understand how being deprived of things makes you want those material things even more! I’ve been there too! Mom had some fun memories too, she didn’t have a father but she had an Uncle that she was extremely fond of. He was so special to her, and he became special to me. She glowed when she spoke of him. I remember her telling me about some baby ducklings at the pond on their farm. On a cold and chilly night she feared for their safety. Mom gathered the ducklings and put them in a shoebox and tucked them under the wood stove. Yea, not a smart move, but as a small little girl, she didn’t know any better! You know what happened don’t you? She was so sad at the roasted baby ducks the next morning and felt really bad. I remember my Dad howling with laughter when she told us that story. Mom was also raised by her Mother that was PA Dutch. Remember my food post at Easter? The Hog Maw Easter dinner? And, they had to be creative with the food that they did have. One of the things she made me as a child was “Waffles and Dressing”. It’s a simple sauce made from milk, flour, butter and cinnamon and it’s poured over toasted waffles. I LOVE IT! However, mine doesn’t turn out quite like hers, at least I don’t think it does but then everything our Mom’s make always tastes better right?? First, I set a picture of my Mom as a child on the counter so she can watch me cook and I can remember her cooking this for me. Then I gathered my ingredients and realize again that I will never ever get this to taste as delicious as my Mom did! I have to warn you, this is not healthy or waistline friendly but I do promise you it is absolutely delicious!! Okay, back to the recipe…..
Use a small saucepan and have all your ingredients ready. I put the brown sugar and flour in the pan as it was heating over a medium heat, and used a small whisk to blend together. Then I added the butter and continued to whisk until it melted, only a few seconds. Next, I gradually added the milk, about a ¼ cup at a time. Continue whisking, as it starts to thicken add another ¼ cup of milk. When all the milk is added to the sauce, turn the heat on a low heat so that it continues to do a low simmer, keep an eye on it stirring occasionally. Add the cinnamon and stir well, remove from heat. Pour over toasted waffles and top with a sprinkle of cinnamon. Or even some cinnamon whipped topping!!! YUM! You can probably feed about 4 people with 2 waffles each. I like a lot of this sauce over my waffles, I’m crazy for it!!!! Hopefully soon, I’ll post the chocolate sauce that my Grandmother made for me when I was growing up. She also made it for my kids and my son still raves about it!